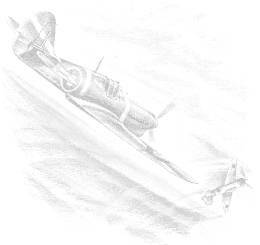 Known as the Kittyhawk in RAF service, this name was generally retained throughout the aircraft's' service with the RNZAF, even when the later models' official name was Warhawk. The first brought on charge in New Zealand were 44 P-40E-1 's (NZ 3001 - NZ 3044) received during April/June 1942, and were used to equip No.2 (Fighter) Operational Training Unit, and No. 's 14,15 and 18 (Fighter) squadrons. These aircraft were retained in New Zealand for training purposes, and local defence. By the end of the war, no less than 32 of this batch had been lost or written off in accidents (11 in collisions). 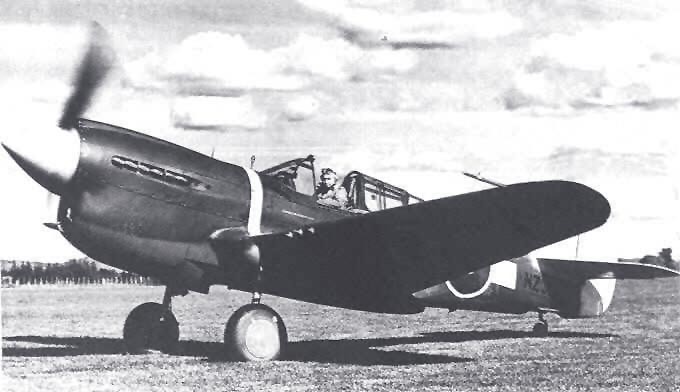 P-40E NZ3038 of 15 Squadron based at Ohakea, 1943. Colours and markings are Dark Green/Dark Earth/Sky, with Sky code letters. In October 1942, No.15 Squadron was sent to Tonga to take over 23 P-40's from the U.S. 68th Pursuit Squadron, thus releasing the American squadron for front line service. These P-40E's (NZ 3091 - NZ 3098, NZ 3100 and NZ 3108) and P-40K-15's (NZ 3090 and NZ 3099) were ex-RAF contract aircraft impressed by the U.S. at the start of the Pacific war, and were in a sorry state of repair (five never received RNZAF serials). Most of the serviceable aircraft were sent forward to defend Espiritu Santo in the New Hebrides Islands in February 1943, the 10 survivors returning to New Zealand later that year. After their return to New Zealand, they were repainted in Foliage Green and (NZ) Sky Grey as were many locally based aircraft at this time. One of the 'Tonga' P- 40's, NZ3095, photographed in New Zealand during late 1944. It has been repainted in the Foliage Green / (NZ) Sky Grey scheme. Note: White lettering on fuselage reads SUITABLE FOR AROMATIC FUELS. 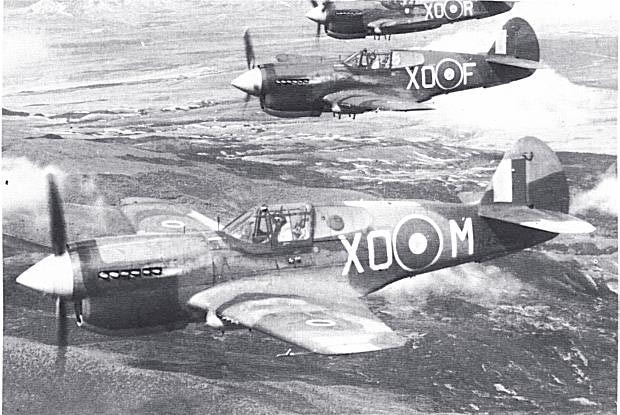 When No.15 Squadron left for Tonga, No.17 Squadron was formed at Whenuapai and took over the P-40E's left by them. 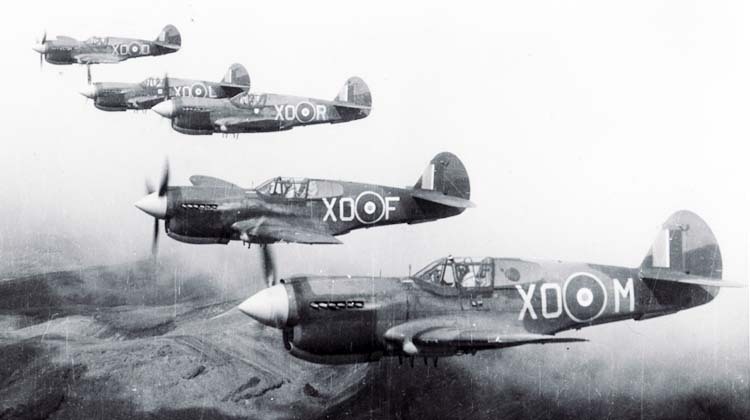 By January 1943, P-40K's and M's had begun to arrive in New Zealand, and the existing squadrons and several more formed at this time, began to re-equip with these later model aircraft (14 - 22 squadrons). Of these, only 14,15,16,17,18 and 19 were to fly the P-40 operationally, as the other three squadrons were converting on to the Vought F4U-1A Corsair at this time.